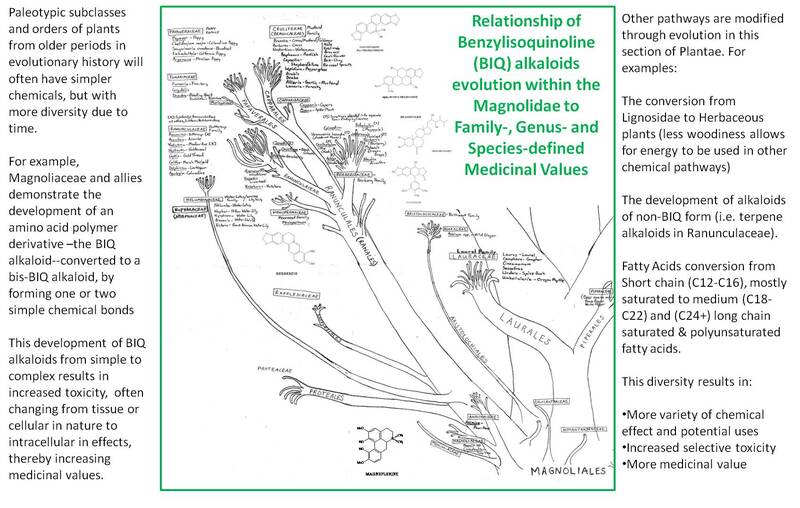 A small section of the Plantae charts, with teaching notes. All standard taxonomic groupings: Division (Phylum), Class, Subclass, Order, Family, Genus. Additional grouping incorporated into the evaluation: Thorne’s Superorders, as well as the contemporary and sometimes past or alterantive recommendations for Subfamilies and Tribes. Taxonomists’s work reviewed for this project: Linneaus, Engler and Prantl, Britten and Brown (American plants), Cronquist (more to come). Chemotaxonomists’ work reviewed: Robert Thorne, Dahlgren (more to come). These are reviewed separately, since they have very mixed applications in terms of ethnobotany. At some point, they will be merged with the above data for a separate presentation. Some groups have very limited distribution in terms of ethnobotanical importance. There are several groups that as research continues, are expect to appear more applicable to inclusion in this review. The benzylisoquinoline alkaloids for example have numbers human and natural ecological and environmental features attached to the reasons for their presence. The classic uses are most important for this review. Scientific progress will no doubt find many more subcategories for specific plant product uses. Identifying these fairly infrequent if not rare, and sometimes misappropriated or misclaimed uses, as a part of these tables would be produce more a table of exceptions and unqie findings rather than a table that demonstrates the most basic features shared between plant groups. Like I said on another of my web pages, Occam’s Razors can be detrimental to searches developed for the identification of shared features and similarities. These tables are meant to provide insights more at an ethnobotanical level, at the pre-industrial level, not the Occam’s razor level so common to plant products research.